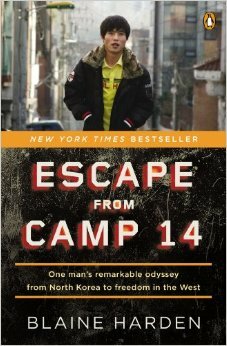 Escape from Camp 14 is one of those true stories that makes one question oneself. Shin Dong-Hyuk, the titled escapee, is from the beginning presented as an unreliable narrator. The author, Blaine Harden, is a journalist attempting to set the record straight on what actually happened in Shin’s life, as Shin has changed his story from the first time Harden wrote about him. If we’re used to reading fiction, we as readers don’t often fully considered unreliable narrators. If we’re citizens of affluent countries reading about hardships in other countries our expectations tend to be a desire for some kind of cathartic experience. This is reflected in many of the reviews of the book both on Amazon and Goodreads where readers express their frustration that they did not have an emotional connection with the main character. This is said to be Harden and also Shin’s fault, but I pose the possibility that this has nothing to do with them, but our expectations as readers. Why do we desire a cathartic experience from Shin’s story? Does he owe us this for some reason? Will we have our experience and then go on and take down the North Korean government? Will we throw money at the problem and hope it goes away? These questions are not to blame readers, but to probe our expectations. Yes, Shin is an unreliable narrator. He’s human and just as sinful as both us and his oppressors. Sometimes we forget that like any human being, victims sometimes lie, are sometimes selfish, and often don’t fit into whatever box in our mind that we’ve created for them. Shin is a victim because he was raised in the camps, but he’s also not a victim, he’s a survivor. He feels guilt for what he did in the camps, but all of his betrayals, right or not, helped him to survive. He’s still trying to survive in a world where he’s expected to behave like someone who grew up in freedom. He’s expected to be honest, but was never raised to be honest. Yes, his lying is irritating, but does it really lessen his story? It’s obvious he went through trauma of some kind, and I think it’s kind of morbid on our part to want the victim to recount their awful experiences in gory detail just so we can have an emotional connection. These people are plagued by guilt and continual nightmares and we want catharsis for ourselves, just because we want to be entertained. I ask again, does an emotional response mean we are actually going to do something about the problem, or will we think on it a day or two and move on with our lives? This isn’t, again, to criticize, this is to be realistic. Stories of this kind are important to be told, but for most it’s one book in a long line of books that we read in our lifetime. So our expectations should perhaps be more reasonable. The truth isn’t easy to come by. It wasn’t during WWII with the Nazi camps, and it isn’t now. Shin’s story is his story and if we learn something from it (even if the details aren’t exactly perfect), that’s not a bad thing, and in the end, he doesn’t owe us a thing. We can criticize his way of thinking and his actions, but that’s not going to change his actions or his way of thinking. He’s a flawed human being, just like we are. And just like us, he knows his faults and is trying to remedy them. Speaking of criticism, I found the paragraphs discussing the callousness of South Korea’s response to the atrocities of the North as the pot calling the kettle black. South Korea and the United States are both driven by work, success, and the like. We like working, want to succeed, and have done so many times over, often to the peril of personal relationships and human kindness. This, however, does not make Capitalism, competition, making money, or the drive to succeed bad in and of themselves. To try to succeed in life is honorable, to make something of ourselves is also honorable. To step on others to get there, not so much, but this is something we have in common with Shin. It’s not always an easy choice. Our advantages often come on the backs of other’s disadvantages. If our ally got to the barbed wire first, suffered and died because of it, is it right for us to climb over his dead body to escape? If we survive, we feel guilty; if we succeed we also feel guilty. We are so lost to the truth, that we can’t even be sure if our guilt is justified. We feel guilty about feeling guilty. Is forgiveness even possible? As a Christian, I believe it is through our Savior Jesus, who died that we might live, who took all that pain, guilt, and pseudo guilt on himself, so we could wear robes of holiness in the eyes of God, and be saved. It’s easy to criticize people, societies, and countries for doing nothing about atrocities, but what honestly could we do that’s ever enough? Could tons of money solve the problem of North Korea? Could an invasion or a takeover? We could maybe end the camps, but can we stop the thinking that leads to the camps? WWII ended Hitler, but it didn’t end the thinking and ideas that made his takeover possible in the first place. These questions also pale in comparison to a more immediate problem: Claiming to care these days is considered to be moral high ground. The southern border problems of the U.S. are case in point. So many people claimed to care about the thousands of children coming across our border this year, but their caring (including mine) stopped at actually addressing not only the problem, but also the concerns of citizens in allowing so many to cross our border at one time and stay indefinitely. The people with concerns got criticized harshly while those who “cared” got to act holier than thou by proclaiming how much they cared on social media. And now that crisis has been overtaken by the latest fear of Ebola in which the same puppetry plays out. This claiming to care, this need for catharsis from others’ sufferings, are just that old selfish human nature coming to raise his ugly head. If we claim to care, we can feel good about ourselves, even if we will not or cannot do anything about the problem. Same with an emotional response. If we have the right emotional response to an atrocity, well, we must be good people even if our very next act is to go about our daily lives as if that catharsis never happened. We snottily tell others what they should pay for, all without ever planning to give a penny of our own income. The petty tyranny of “good intentions” is alive and well today as it always has been. Petty tyrannies are only part of the real threat to freedom: actual Tyranny. Put the blame where it belongs, on the North Korean officials who perpetuate this awful system of oppression and fear. Is “the system” really an excuse for the evil men do? Did all of the people have go along with the Nazis and their concentration camps? They could have rebelled (some did) at the cost to their own lives. It’s never an easy choice to do the right thing, and sometimes we aren’t even sure what the right thing is, but putting the blame on those who live in freedom is faulty at best. The free people are criticized severely no matter which choice they make, to help or not. Our cry of compassion should not be for others to give what they have, but for us to give what we have, for us to be the change we want to see in the world. Even Shin, who was not taught honesty, knows this. It’s why he struggles with nightmares and guilt, and is frustrated by those well-intentioned people who think they know exactly what he should do with his life. It is so very easy to spend other’s time and money, to tell others what they should care about, who they should help, and to dismiss their fears. How much harder it is for we as individuals to put our own time, money, and effort on the line! To put our own skin in the game and struggle with the problems that can come with (fore example) a mass migration no matter the reason. Skin in the game is why, despite its flaws Capitalism and competition are superior to both Socialism and Communism. Even today, too many young people are still taught that Socialism and Communism are good things. They are taught that the evilness of human nature only comes out in Capitalism, consumerism and competition. They are taught to look at those who own businesses and make money as evil. The young are taught this in free societies thriving on competition and Capitalism, in places where they themselves have little to no threat of the tyranny and death toll that both Socialism and Communism bring. They are taught that those who invest should reap the same reward as the employee who is flipping hamburgers, despite the fact that the investors may have put days or years of more time into their work efforts, and also a lot more money. Are burger flippers really in the same situation as Shin in Camp 14? Do they honestly have no other choice but to be burger flippers? If they “escape” the burger flipping by working harder, taking the risk to move up in management, or paying for more education, should they be chastised? Are they climbing over their colleagues’ dead bodies to get through the electric, barbed fence? Greed is a sin, yes, but envy is too, and “Workers of the World Unite!” is the cry of both the greedy and the envious without at least the virtue of hard work to temper it. It is a cry that falls prey, time and again, to the tyrants of this world – and there are many. Self-sufficiency (as apart from government) is the best way of keeping tyrants at bay. Human nature is selfish, and those that promise a new system where everyone is “equal” or forced into equal outcomes in life, is only a cover for those tyrants who wish to have more of the proverbial pie than most. Socialism and Communism are most often idealized by the young, because they are childish notions with little understanding of how the world and selfish human nature work. Capitalism and Republics, for all of their faults, are for adults, those who wish to make their own paths in life and who are willing to risk failure in order to succeed. It’s hard to force people into freedom and self-sufficiency, because they are alien ways of thought in much of modern life. We are inundated daily with the idea that governments hold the key to all happiness for society. But how can this be when governments are run by flawed people who are at heart selfish, and who only want to stay elected, and keep their jobs, so they don’t have to invest in another career? Time and again, we are shown just how greedy so many officials and politicians can be with money that they did not earn and that is in no way their own, and yet we still believe the Communism/Socialism/Nazism/Totalitarian fairy tale. True, having too much can corrupt, but so can having too little. Envy is a different beast than greed, hiding in the deep recesses of our hearts, it gnaws away at us, a green monster to which an honest and open greed pales in comparison. Shin is actually pretty honest in what he wants: a full belly. He wants to eat, and eat well, and he is doing what he can to ensure that happens. And he is also at least striving to tell his story and in some small way help those who are still prisoners of the country we call North Korea. May God be with him in his continued struggles and help to find peace of mind and the forgiveness that all of us need so desperately. And may God help us to put our expectations where they belong, on ourselves first and foremost, to be His hands, and His good in this world.